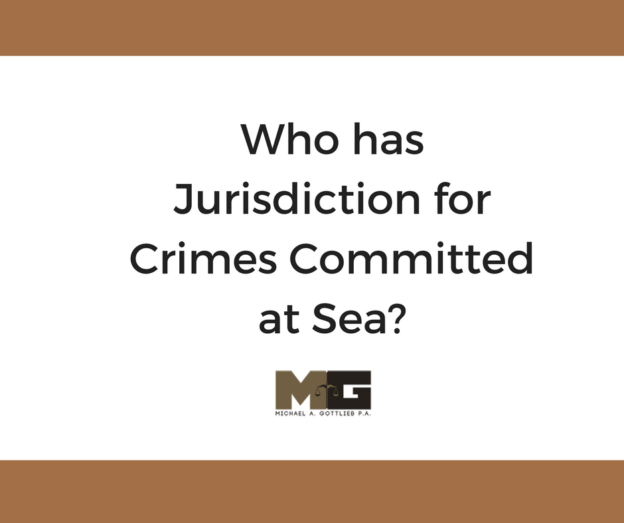 Who Has Jurisdiction for Crimes Committed at Sea? Handling crimes committed at sea is quite complex. This is primarily because the issue of jurisdiction has multiple layers and different rules may be applied all at same time. A state’s jurisdiction means that it can enforce its laws over a perpetrator or victim of a crime. Jurisdiction may be invoked if a crime happens within their territory if one of its citizens is involved, if the crime has an impact on national security, or a crime so heinous takes place that multiple nations decide to enact punishment. Most of the time, the problem lies not just in how to take care of a certain situation, but in locating the proper authorities that are allowed or should be investigating a particular crime. Figuring out who has jurisdiction over a crime requires the consideration of many different factors. This includes the state that has territory over the ports and seas, nationalities of the people involved, the flag state of a ship where the crime has been committed, and many others. The Territorial Sea Baseline (TSB) marks where the coast and territorial sea meets. Any waters within this border are within the jurisdiction of that country. The laws of a port in which a vessel is visiting or had visited will be applied to the said vessel. Moreover, if a crime is committed in international waters, the next port in which the vessel will dock will then also have jurisdiction. The Master of the Ship may alert any incident to the next-port state. If a vessel is traveling through a country’s territorial sea, which is technically 12 nautical miles (nm) from the TSB, any crimes committed will be under the jurisdiction of that state. This applies regardless if said vessel is docking on one of its ports or not. The coastal state has every right to head an investigation if the peace of the state is disturbed. It can also investigate if assistance is requested by the Master of the Ship, or if narcotics trafficking is involved. The contiguous zone is 12 to 24nm from the baseline. Any laws that are applicable within the territorial sea may also be extended to this zone. The exclusive economic zone is the area past the territorial sea that goes no further than 200nm from the baseline. Here, a state may only exercise jurisdiction over economic and environmental crimes. The nationality of the accused, as well as the victim of any crime, may bring a state to claim jurisdiction over an incident. Regardless if the crime takes place on the high seas or in the territory of another country, a state has the power to sanction or protect an individual based on its domestic laws. Extraterritorial jurisdiction is applied when a crime is committed on the high seas, or outside of a country’s territory. The flag state is the country where a vessel is registered. Any crimes committed on board will be overseen by the flag state. This applies even if the vessel is outside of the country’s territorial seas. However, it may often times be seen that the flag state’s role in the investigation of crimes committed away from its borders can be quite minimal. Resources, as well as interest, may become limited. There are far more rules and complexities when it comes to the issue of jurisdiction for crimes committed at sea. For now, we are only covering the bare bones. The seas may be vast and boundless, and so too are the laws that govern it. Your reliable attorneys are happy to answer your questions should you or someone you know become involved in a crime at sea. Call us today for an appointment. Michael Gottlieb will fight for you.